I was hoping for a "stewy winter" this time , but i totally forgot about the lent .When i realized it , i planned to make some chammanthi podi for December to make it a "Kanji winter". Since i am a procrastinator the project was held in abeyance , till my dear friend "L" asked me for a recipe. Wasnt that in November 2nd or 3rd week L? Anyways i wanted to make this and sent the recipe to L , but the ebb and tide of friends and relatives visiting that time made it totally impossible for me. Then my fav cousin Jeff came and he wanted some chammanthi podi so badly to take home to Fl the next day morning...I had no option but to make it at the middle of the night.. A big blow for the procrastinator in me. I made it that night following my Kuttanadan grandma's recipe and was finger licking good. I got to keep a portion of what i made and had to do it again cos of popular demand ;). In a big Saute pan add all the ingredients except salt and tamarind. Toss it continuously , and fry for 30-40 minutes or till they turn dark brown. Switch off the heat. Add tamarind and salt and let cool. Grind it into a coarse powder in a coffee grinder or food processor. If you wannna make it a very fine powder , continue grinding for some more time. It goes best with Kanji !!!!! in our house podi podi..all the time podi...be it dosas or idlis or even rice too...yummy podi! !...beautiful pics! Adipoli chammanthi podi. undkkiytu kalam kora aayi.Kothivarunum. Podi looks yummy, nice clicks ! Podi , pickles are like lifeboats in caboose/kitchen. Yours looks amazing. I wont be surprised if u take pics for living. Awesome job. Keep it up! Lovely click, the podi look spicy and tempting for a quick try. This would make a great X'mas gift. Great chutney - wonderful with idli and dosa!! Sarah,the powder sounds like such a wonderful blend of all the amazing ingredients,and should make just about any dish stand out. I am a north Indian but I am sure I can use this in various ways. You have been tagged in the questionnaire I posted today:) Please check it out! Looks so yumm.. I can live with podi. THis looks delicious with ur beautiful pictures. Podi looks absolutely divine..soo tempting podi..
Looks so tasty. Snaps are so nice..
oh I'm sure the smell of that is divine! Can this be had with idly/dosa/rice/roti Sarah? Looks so nice. this had been my favourite.. my mom used to make it at home and i miss it.. Such beautiful pictures! I bet this was super tasty as well! 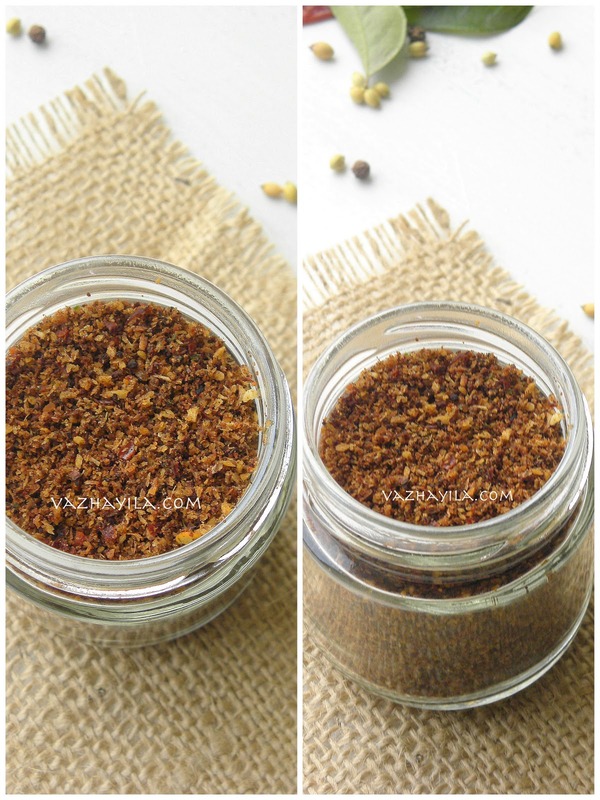 What an wonderful blend of spices!! Awesome pictures as always.. Lip smacking recipe too. A great, storable recipe for instant, anytime use, especially in winter! Chmmanthi podi ithiri engoteku thnau viduo? This looks like a wonderful topping for all kinds of dishes. It is indeed a busy time of the year...so much to do and so little time. kanjiyum chammanthi podiyum...this is perfect for the weather!